With such an eclectic mix of cultures and ethnicities, Penang's festival and event calendar is full year-round. Visitors will delight in the colourful happenings that take place throughout the year around Penang, and may even wish to plan their visits to coincide with some of the biggest events and annual things to do. 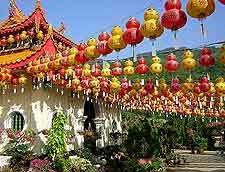 Chinese New Year - in January - is a particularly notable festival given the island's high population of Chinese, while the International Dragon Boat Festival, which takes place every June, is Southeast Asia's most colourful boat race. August is a celebration of history, with the Penang Cultural Festival being nothing short of a month-long homage to the island's multi-cultural heritage.